At this peculiar moment in history, the technology of power cruising combines like good beef stew, but instead of carrots, potatoes, and onions, we are talking about solar energy, lithium batteries, and an outstanding new generation of motors—inboard and outboard. 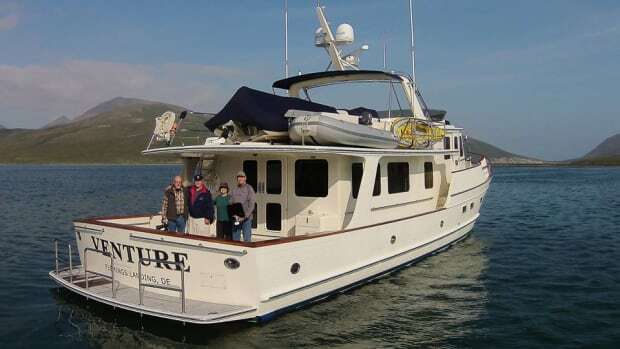 The hull is the beef, of course, and there’s a new breed afoot, a hybrid informed by contemporary sailboat design. But what is all this talk of ingredients without a chef with the skills to make the meal? Meet my friend Lou Codega, naval architect. He’s a graduate of Webb Institute and the Massachusetts Institute of Technology. 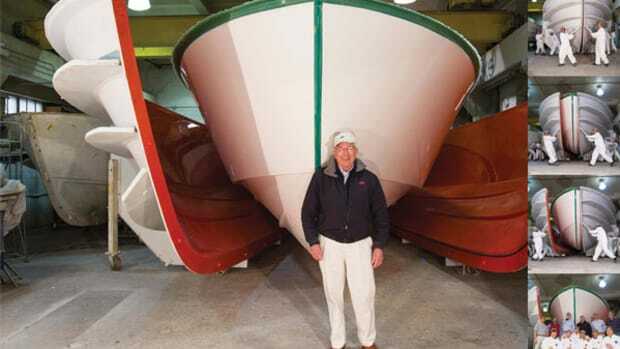 So far he’s created 60 designs, including boats for the Navy, Coast Guard, and for our own niche, the Great Harbour Trawler. For a while, Navy SEALs rode to their missions on a Codega fastboat. He does custom work and has designed Regulator’s center consoles for the past 30 years. He’s known in the industry as a hull man. Codega called me recently with a proposal. He had an idea for a cruising boat and wanted me to play the role of “customer.” Then the boat had better not be too expensive, I said. And so it began. The 32-foot Loxo by the French builder Pogo Structures was the inspiration for Codega’s 34-foot concept boat. For years Codega had been noodling around the concept of “taking a washed-up racing sailboat hull, removing everything that is needed to sail, and turning it into an outboard-powered motor cruiser.” Watching a Pogo video, he was impressed by how the Loxo performed in moderately rough seas in the English Channel. “Sweet running with a nice flat wake” was his assessment. The Loxo has earned some impressive reviews. 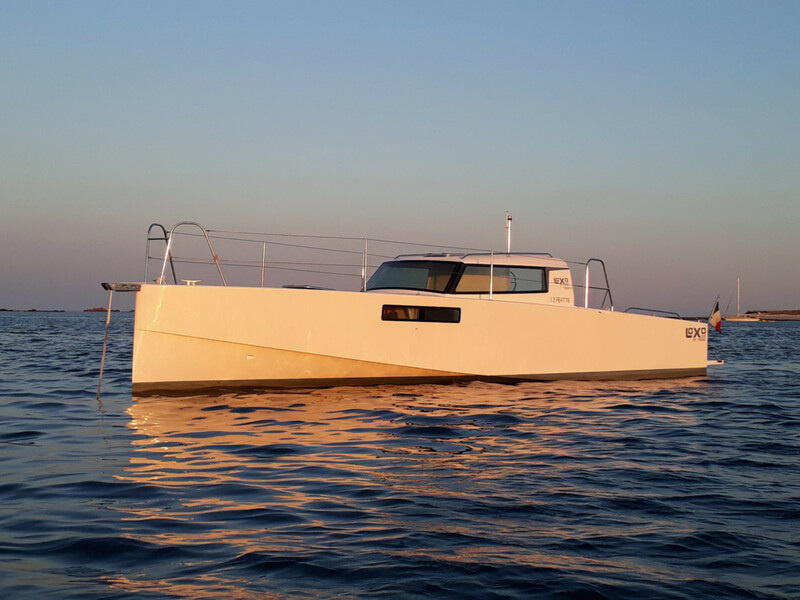 Boatsandboats magazine called Loxo “beautiful” and reported that she consumed just over 0.13 gallons of diesel per nautical mile, powered by twin Volvo 30-horsepower engines with sail drives at a cruising speed of 10 to 12 knots. 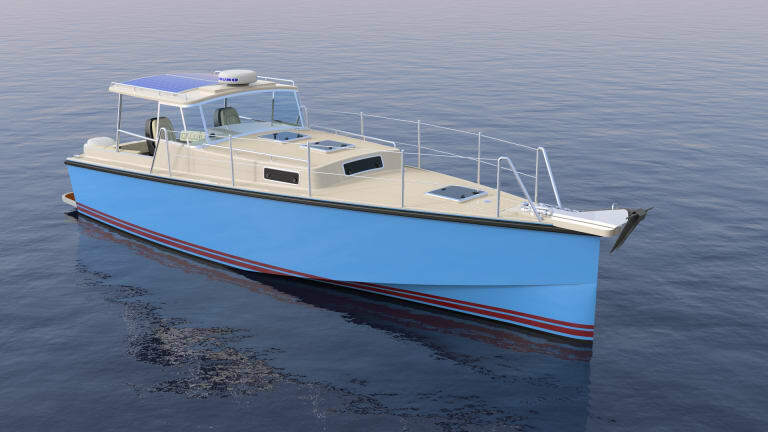 Codega’s solution, as you have probably guessed by now, is to power his 34-footer with outboards. 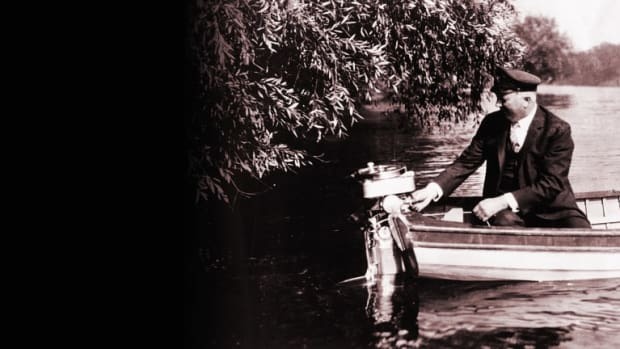 In olden days the outboard carburetor was surely one of Satan’s tools for human torture, but now with almost everything over 10 horsepower having electronically controlled fuel injection, outboards are as reliable as the family car—and as stylish. 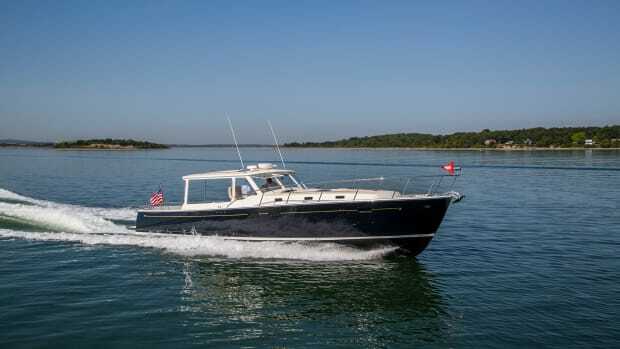 At the Fort Lauderdale International Boat Show last year, I noted a growing number of small outboard cruising craft in the trawler section. It’s a trend, and for good reason. Outboards free up a lot of space inside the vessel for accommodations and storage. 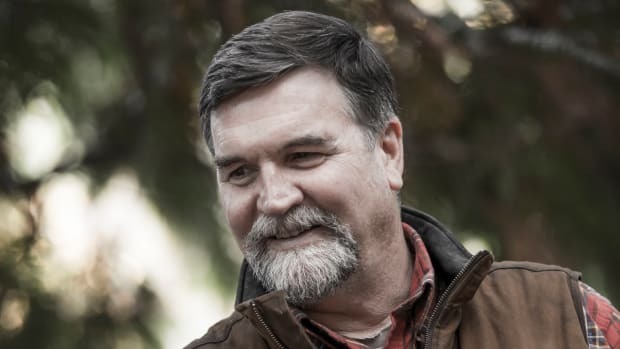 Outboards are quiet and seem even quieter at the helm because of distance and the fact that they are, well, “outboard.” Outboards now incorporate high-amp alternators to supply a cruising battery bank, and the manufacturing process is much simpler than the machinery installations needed to support an inboard diesel. A builder can complete an outboard installation in under a couple hours, Codega says. And there are certified technicians for all the major brands all along America’s waterways. I saw my role as faux customer to be an advocate for the small twin-engine option. As a denizen of Florida, I like the redundancy of twins for cruising the Bahamas, which have some lonely waters to explore and often no one to rescue you. But Codega and I agree that buyers keeping to inshore U.S. waters would be just as happy with a single motor and a towing insurance policy. Thus, Codega has sidestepped the eternal, and often silly, single-versus-twin debate. Of course, the various engine options represent differences in weight, and this boat is light thanks to a foam-cored hull. Codega has a way to compensate, however. 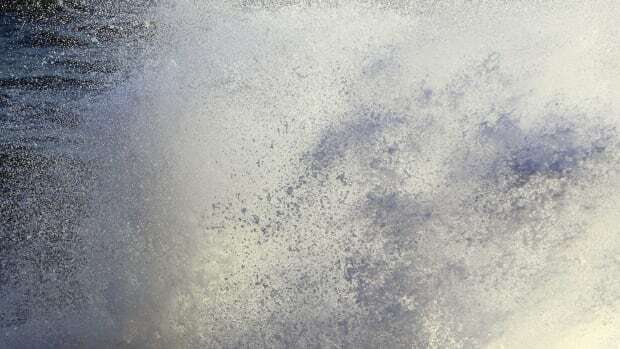 The volume of the enclosed aluminum bracket/swim platform would vary depending on the weight of the engine or engines, thus ensuring correct trim. Clever that. If you wanted to careen the boat on a tide, the boat would rest level as if on a tripod formed by the forefoot and the two boards. 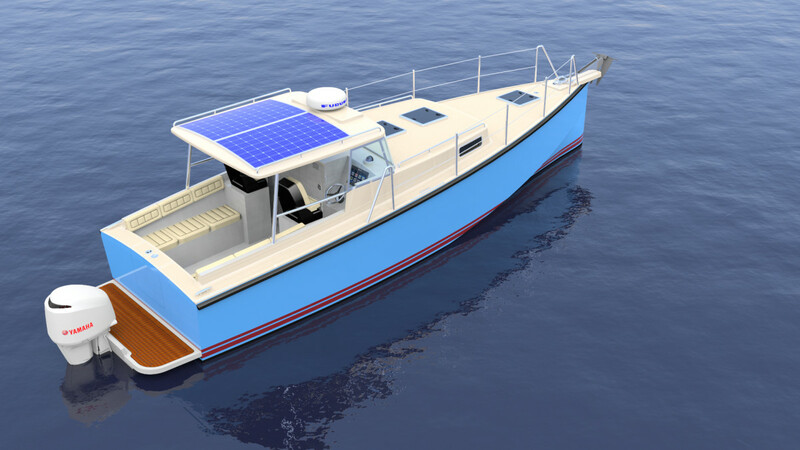 It’s a given that the Codega boat would be rigged for shore power, and at anchor the fridge and other power consumers would run from a battery bank topped off by solar panels. A small portable genset could take the edge off by powering the boat’s air conditioning at anchor, something like the ubiquitous Honda 2000. After all this is a gasoline boat already, and southern cruising grounds can get blisteringly hot in summer. I suggested creating a standard “nest” on the swim platform and essentially hardwiring the genset into the boat’s electrical system. An aftermarket gas cap with fuel hose fittings would also allow the generator to pull gas from the boat’s fuel tank into its own integral tank, eliminating the need to refill. When not in use, a heavy-duty canvas cover would protect the genset from the elements. Or you could skip that detail and just keep the portable generator in a locker to be deployed as needed. And you might want to keep that space on the platform free for a tender. At the risk of generalizing, I don’t believe European builders pay as much attention to dinghy stowage because their customers cruise differently than we do. (Feel free to correct me on that.) 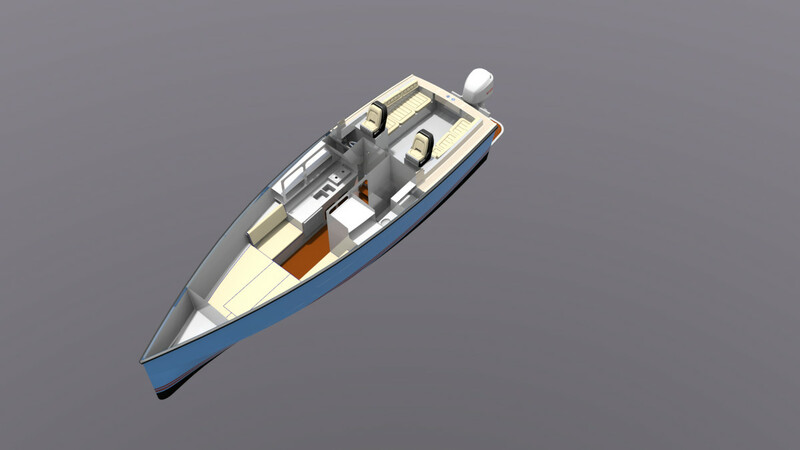 On the renderings, the space shown between the forward face of the outboard and the transom seems like it might fit a small inflatable on its side. Just drag it up and secure it, after having stowed the dinghy motor in the cockpit. 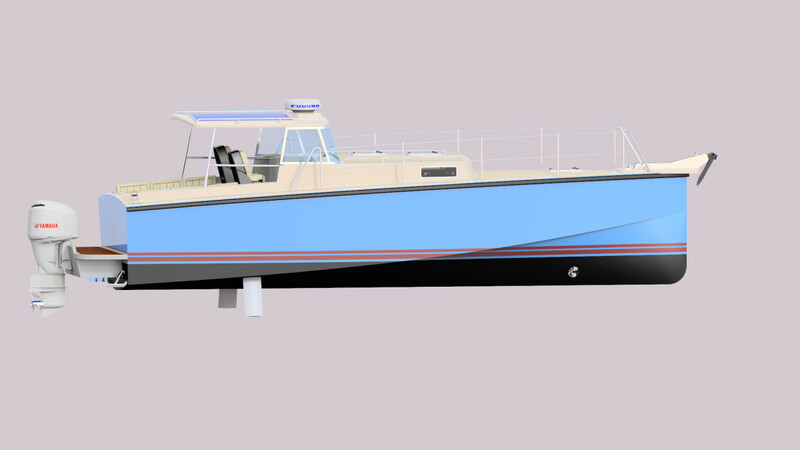 Codega’s sailboat hull/outboard cruiser concept. The Gulf Stream is calm: You leave Palm Beach at 8 a.m. and arrive at Green Turtle Cay in time for happy hour, skimming over turquoise waters at a comfortable 20 knots. Later that winter, you attach the trailer (it will need its own brakes) to your pickup truck and head for Puerto Peñasco, an hour south of the border on Mexico’s Sea of Cortez. Now you can cruise all the way to Cabo San Lucas, averaging 10 knots and only refueling once. Summer comes, and you trailer your Codega 34 up to Seattle for a circumnavigation of Vancouver Island. You get the picture: One boat does all. Now let’s talk price. Codega insists that I could have his boat built for $150,000 as long as I, the customer, adhere to the simplicities inherent in his concept. I’m skeptical because I don’t see anything comparable on the new-boat market that inexpensive. (Yes, I know it’s a relative term.) I must concede, however, that Codega does this for a living and I am just the dumb customer. Towing and transport aside, and even if Codega’s pricing is off by $50,000, his boat still seems like a pretty good value. I’m saving my change in a jar, but before I sign the contract, I would be interested in hearing your comments and so would the chef. The driving factor of most people’s enjoyment of a boat is lack of roll. You need only to look to online discussions and, most significantly, to the money being spent on gyrostabilizers to realize this for yourself. 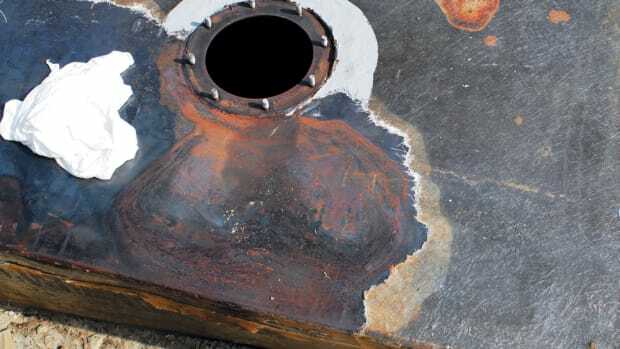 Boat rolling is, in the most elemental form, a spring-mass-damper system, and a quick look at any reference will show how important damping is to reducing the response of the boat. But this is so often ignored, or perhaps not understood, by both designers and boaters. A great source of roll damping is the hard chines that I try to incorporate into my trawler designs. People are willing to pay tens, and in many cases hundreds, of thousands of dollars on sophisticated mechanical systems but overlook the benefits of a hard chine, which are free.